It’s easy for marketers to see the value that comes from using targeted messaging and dynamic content to send highly personalized offers to prospects and customers. The challenge has been finding and implementing a configurable technology platform that also provides a user-friendly workflow to manage variable offers, text, and images. Our response to that challenge is IWCO Direct 1to1℠, a unique Dynamic Content Management (DCM) solution that combines a highly configurable technology platform with a workflow approach. This combination allows for collaborative management of dynamic content and marketing rules to deliver targeted messaging. IWCO Direct 1to1 uses data, assets, content, variable rules, and targeting rules to improve change management and quality control while delivering marketing communications with a high degree of timeliness and accuracy. 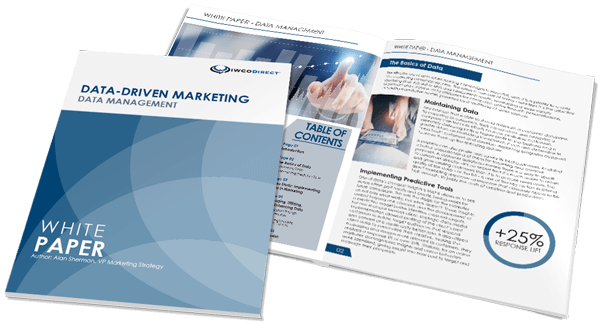 IWCO Direct 1to1 uses Messagepoint’s robust Customer Communications Management (CCM) solution to produce the most efficient and effective means of personalized marketing communications through a wide range of delivery channels. Using this centralized platform accelerates both the change management and creative development cycles. Artificial Intelligence (AI): Comprehensive programmatic machine learning algorithms offer capabilities to review not only precise message content across a variety of communications, but also semantic similarities across complex messages. The result is more efficient cross-channel and omnichannel messaging and reduced resource effort. Concurrent Development: Enhanced version management and content synchronization allow efficient “multi-tasking” by enabling cross-functional resources to create messaging and content for multichannel communications that can be easily synchronized across a variety of communications. In addition, robust management and delivery of pre-defined layouts and dynamic messaging content with advanced change management tracking and notification make development fast and efficient. Customer Experience Simplification: IWCO Direct 1to1 uses powerful yet flexible metadata templates and tagging that support real-time interactive content change and immediate visualization capabilities. This allows rapid solution deployment and scalability across a variety of internal and external organizations. Cross-Platform Connectivity: While this isn’t a new concept, it is worth noting that IWCO Direct 1to1 maximizes benefits to clients through advanced API, web service calls and rapid deployment of connectors to industry-leading marketing and production delivery platforms. These improvements and enhanced capabilities drive organizational benefits that can be realized regardless of industry vertical, company size, or complexity of marketing communications. Direct client user interaction and control in a secure environment streamlines the process, thereby reducing costs while simultaneously improving the change management and development cycle time. Does your marketing program have a need to rapidly adapt to changing market conditions? Contact me to learn how IWCO Direct 1to1 can optimize your communications workflow.